Manchester United have been linked to a number of attacking midfielders since the transfer window slammed shut at the end of August. Mesut Ozil, Alexis Sanchez, Gareth Bale, Willian and Malcom have all been strongly linked with us in recent weeks. Now the Daily Mail are reporting that we are keeping tabs on young Borussia Dortmund forward Christian Pulisic. However, the report doesn’t go into much detail nor state that we are set to make an offer for the recently-named USA Player of the Year. Pulisic is regarded as one of the best teenagers in world football right now with Transfermarkt valuing the 19-year-old at £40.5 million. With Borussia Dortmund struggling to compete with Bayern Munich in recent seasons it would surely be possible to attract the teenage sensation to Old Trafford with a reasonable bid. 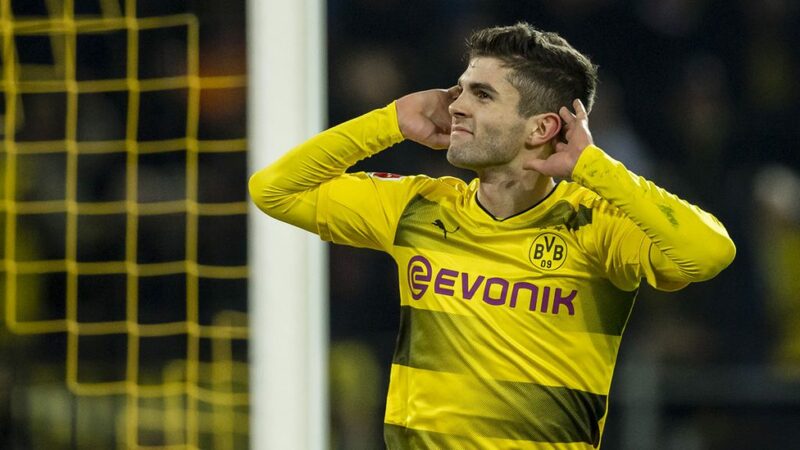 Christian Pulisic is predominately a right winger, a position that it seems Jose Mourinho is keen to upgrade. So far this season Juan Mata, Jesse Lingard and Marcus Rashford have all been used down the right wing with no consistent success. And with Henrikh Mkhitaryan seemingly on his way out of the club the Armenian could be used as part of an exchange deal. However, Liverpool saw bids rejected for the youngster with Jurgen Klopp’s former side believed to be holding out for over £35 million. That fee should not be a problem for us if Mourinho values the player that highly. Christian Pulisic is an excellent dribbler but his decision-making in the final third has so far let him down in his young career. The player can be selfish at times and hasn’t shown to be a great goalscorer, but all of that can be developed over time. Whether we make a move for the American international remains to be seem, especially with strong reports that Chelsea’s Willian could be on his way to Old Trafford in the near future. Mourinho has had no success on the right wing this season, Juan Mata, Jesse Lingard and Marcus Rashford and he wonders why? Not one of those players are out and out wingers. Speciality players for special positions, remember that comment during LVG’s reign.